Intel may have more than Coffee Lake Refresh processors in store for us, as a new report suggests the company will also be launching a new series of motherboards and Skylake-X Refresh processors. 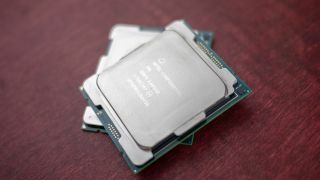 Intel will supposedly introduce a new Z399 platform to succeed its current high-end desktop X299 chipset, according to PC manufacturer who spoke to PC Builder’s Club. The Z399 chipset breaks away from the trend of Intel using an X-designation for its HEDT platform, and it’s mostly due to AMD already snapping up the X399 name for its Ryzen Threadripper and Ryzen Threadripper 2nd Generation CPUs. According to the insider source, Z399 motherboards are already being made to order for SkyLake-X Refresh processors that may launch this October. However, before you get excited about Intel finally introducing its 28-core processor, this long-anticipated chip supposedly won’t be coming with this generation. Instead the PC manufacturer says the rumored Z399 platform’s LGA 2066 socket is only designed to fit up to a 22-core CPU. We reportedly shouldn’t expect Intel's 28-core processor to appear until the start of 2019, when it will supposedly be launched as an Intel Cascade Lake-X series chip.